We begin this trade with Gunn as he's still in a coma from the battle that ended season 5. There are several demons that would like to lay claim on killing him, but Illyria won't have it. She's having a bit of a crisis herself as she's struggling with the memories from Wesley and Spike of Fred and her newfound humanity. After that brief interlude, we have a short arc revolving around Drusilla and actually written by actress Juliet Landau. Drusilla was always one of my favorite vampire characters while watching both Buffy: The Vampire Slayer and Angel, so this was a real treat for me. Some of the covers from the actual series that are in the gallery at the end of this trade are really great to look at. I'm thinking about picking up the 2 Frank Urru covers of Drusilla in her padded cell. The story gives you a good sense of what Dru is going through after her last appearance on TV. As you can probably guess by the clue I threw at you, she's been locked-up in a mental hospital to get help. Something tells me that she doesn't get the help the doctor's were expecting to provide. The bulk of this trade revoles around the "Last Angel in Hell" storyline, which just so happens to be the title for the movie based on the quasi experiences of our heroes as L.A. went to hell and back. The first part is actually a throwback to an old episode of Buffy: The Vampire Slayer where people in costume become what they are costumed as. This is especially funny because the setting for this dibacle is a comic-con sytle event where so many people are in cosplay. And what happens when Spike is caught in the spell while he's costumed as Angel? The tail end of this trade is the actual "movie" adaptation of "Last Angel in Hell". You get a fairly good idea of who the stars in this movie are supposed to be. Angel is portraited by Nicholas Cage and Jorge Garcia as Gunn. 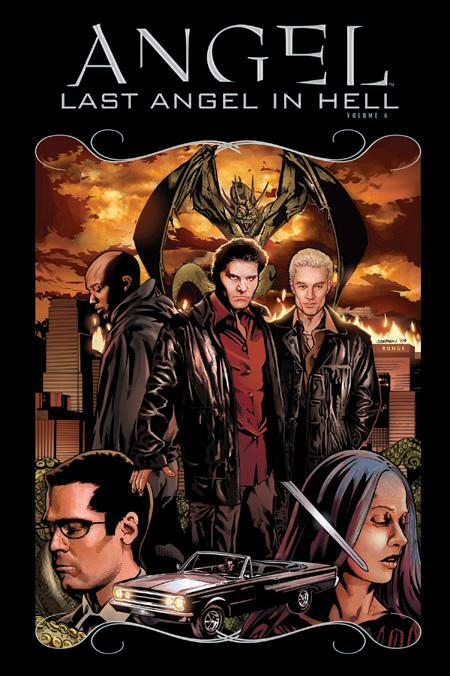 I can't quite figure out who plays the other characters, but in the adaptation Spike is female and in love with Angel. Pretty funny and campy, but worth the read.